Samsung this week updated its Internet Browser for Android (pictured on the left), making it faster and better than ever. The latest version of Samsung Internet Browser (v. 7.2) uses an upgraded engine - Chromium M59 - thus offering a speedier browsing experience and enhanced graphics in online gaming. 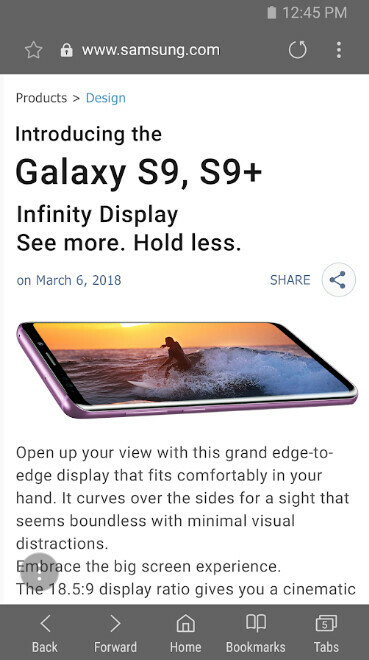 The new Internet Browser from Samsung features protected browsing (alerting users when visiting sites that try to steal information or install malware), and various interface improvements (including an “Add to home screen” icon for web apps, and a reader mode for news articles). Furthermore, tab switching has been optimized, and is now more efficient on low-end devices with 1 GB of RAM or less. At the moment, these novelties are available only in the beta version of Samsung Internet Browser. We assume that the regular version will gain the new features pretty soon anyway. Both the beta and the normal version of the browser are available to download for free on Google Play - see the first source links below. As you may already know, you don’t necessarily need a Samsung phone in order to use Samsung’s Internet Browser. You can install the browser on pretty much any mobile device running Android 5.0 or later. Best browser just got better. Best browser indeed got better. Best feature I love is the extension which is super functional at blocking annoying ads on phonearena. You do know what a beta version is, right? samsung uses software in it's cameras....look outside the lens. Nope we also have a better file manager than googles and apples offerings. We also have a better music player than the stock google one. Plus I prefer Samsung Notes over googles. I love the Samsung browser, smooth and hella features. long time ago, i forgot chrome on mobile. chrome on mobile, lag and battery drain fast and make cpu hot. That was long time ago. It offers a better experience now. If you want a miserable experience sure. Chrome sux! Samsung Browser is the best! It is a great browser if only it showed always the full address in the address bar. I low-key love Samsung's browser. I think I've even taken for granted how intuitive the functionality is until having seen this article...And, isn't the secret tab mode kinda cool? Chrome works just fine on phones flagship phones. I just downloaded the Samsung browser and frankly I don't see what it has on Chrome. A snappier response and Ad-block? Bottom screen navigation did the trick for me. I wish all the apps had this. When you already have a back button why would you add another at the bottom? No app should have that bottom navigation bar, that's the only reason why I use Chrome. Like the browser but sometimes stops responding when loading pages. Turn java off and loads quicker with no response issues. Just none of little pics beside the articles. Seems like this only happens on the web site. The very site that cause me to down load a add blocker. Hey PA. Fix your site. The regular version is still 6.4. Can't wait for the update.